Make Way For Celebration: These Ducklings Are Turning 75 Robert McCloskey was a young artist when he brought a crate of ducks back to his studio apartment. Since then, the plucky Mallard family (Jack, Lack, Mack, et al.) has charmed its way into our hearts. 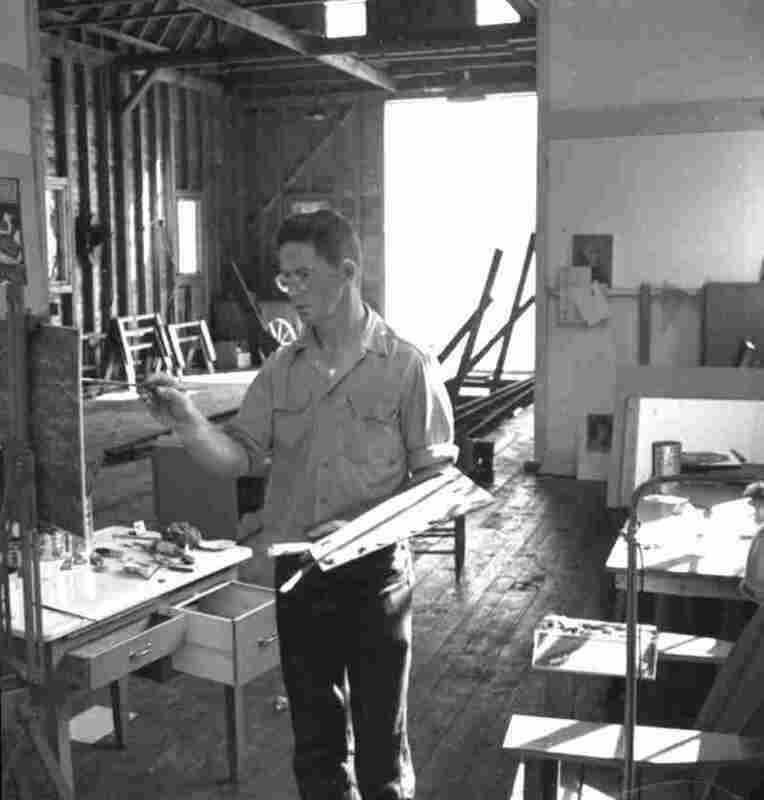 Robert McCloskey was still a young artist when he brought a crate of ducks back to his studio apartment to do some sketches. Since then, the plucky Mallard family (Jack, Lack, Mack, et al.) has charmed its way into our hearts. Many people know Make Way for Ducklings, but they might not know the lengths to which Robert McCloskey went to get the beloved Mallard family to look just right. Robert McCloskey at work in his studio. Itching to begin the illustrations, McCloskey went down to the Washington Square Market, bought a crate of ducks and brought them back to his Greenwich Village studio apartment. He washed the ducklings off in the bathtub, put them in a pan and got to work. The resulting book — the story of the Mallard family's search for a home in the wilds of Boston — celebrates its 75th anniversary this year. It charmed generations of readers and even inspired a statue in Boston's Public Garden. That statue is a favorite spot for Dan Belich and his son, Geoffrey, who recently braved unseasonably cold weather to pay the bronze ducks a visit. "We love coming by here to hang out with these guys," Dan Belich said (while struggling to remember their names, "Quack, Mack, Jack, Ack? I don't know," he admitted with a laugh). Fans of the ducks often dress them in seasonally appropriate attire — on the day of our visit they were wearing Easter bonnets. Sal McCloskey likes to visit the Public Garden and watch the kids clambering all over the duck family. Mrs. Mallard's head is shiny from generations of kids patting it. She remembers the days when her dad — whom she has always called Bob — used her and her sister Jane as models for his sketches. "He followed us around with a sketchbook much as a photographer would follow around his subject or her subject with a camera," she recalls. "He was always there." 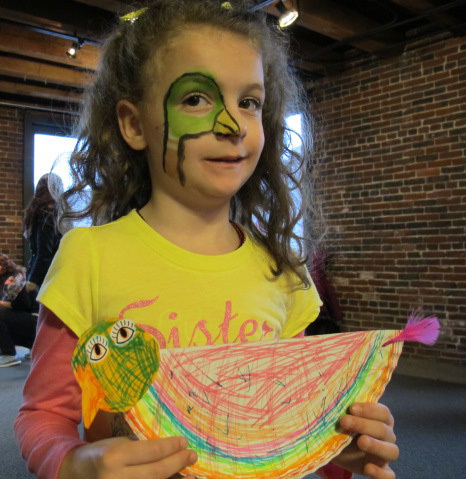 "I love baby ducks," says Grace Miller, 6, who celebrated the 75th anniversary of McCloskey's book at the Make Way for Ducklings Bookstore in Faneuil Hall in Boston. McCloskey got to know Boston when he was an art student in the city during the 1930s. The story of the ducklings' perilous journey through the streets of Boston — from the Charles River to the Public Garden — delighted readers. To celebrate its 75th anniversary, a Boston bookstore, appropriately named Make Way for Ducklings, held a party of its own. 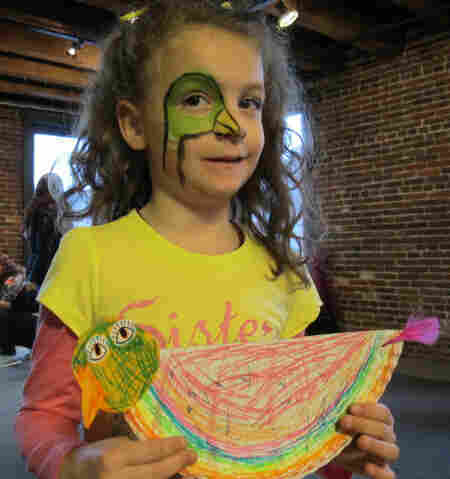 Kids got their faces painted, did some duck-themed arts and crafts and gathered in a circle for story time. Bookstore owner Adam Hirsch says that many of the parents who bring their kids to the store to buy the book grew up reading it themselves. He believes Make Way for Ducklings is a quintessential Boston book with a universal appeal. 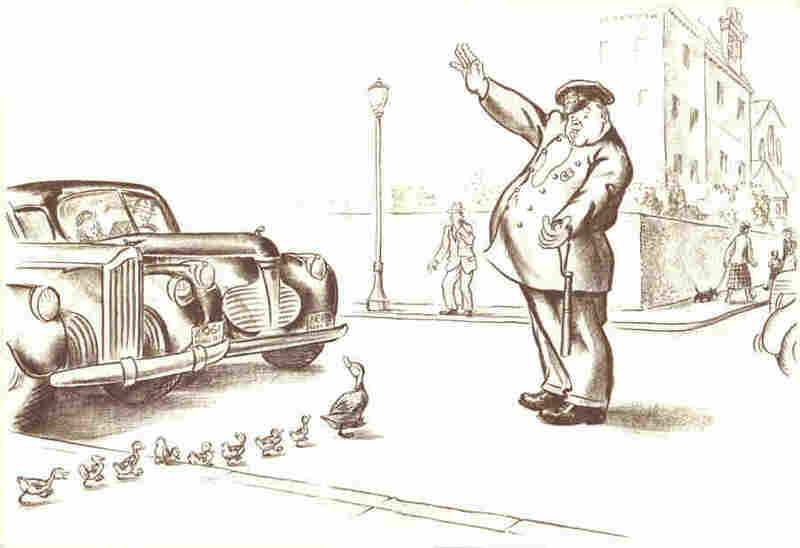 McCloskey was at the very outset of his career when he published Make Way for Ducklings in 1941. The book won him his first Caldecott Medal. He went on to write and illustrate Blueberries for Sal, One Morning in Maine and Time of Wonder -- for which he won a second Caldecott in 1958. He died in 2003 at age 88. 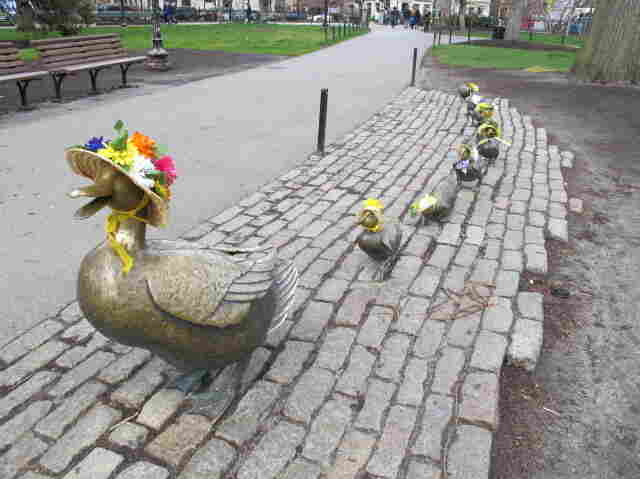 The Mallard family has been immortalized in bronze in Boston's Public Garden. His daughter remembers him as a man who thought visually. "He was an artist and he thought first in terms of pictures," she says. His determined little duck family charmed its way into the hearts of generations of readers in Boston and beyond. After the installation of the Make Way for Ducklings statue, Sal McCloskey went to the Public Garden and watched as a class of kindergartners "met" the Mallard family. "I have to say," she says, "it brought tears to my eyes." Andrea Shea and Beth Novey contributed to this story. 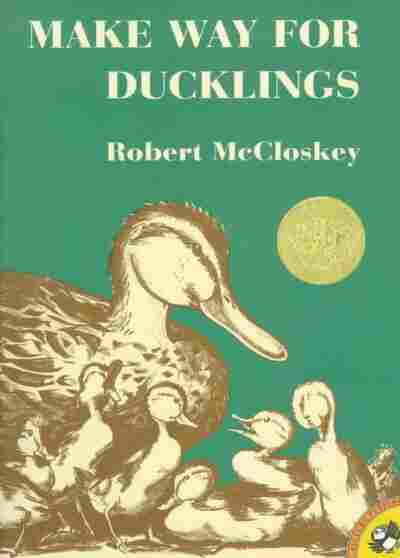 The audio version of this story incorrectly states that Make Way for Ducklings is the only Robert McCloskey book honored with a statue. There is a Blueberries for Sal statue in Boothbay Harbor, Maine.